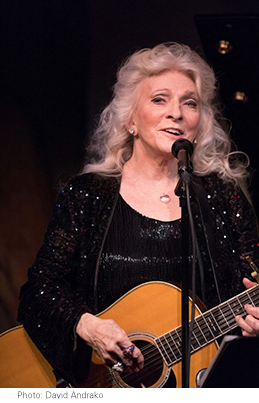 Judy Collins ended her set at the Café Carlyle yesterday with Leonard Cohen's "Suzanne," a bittersweet homage to the Canadian novelist, composer, and performer--as it turned out. Of course "Suzanne," from her 1966 album In My Life, is a standard part of her repertoire; it was only after her opening night that guests learned of Leonard Cohen's death at 82, and looking back, this encore had special resonance. Moving from this song of love, to its spiritual digression, ("And Jesus was a sailor when he walked upon the water"), Collins' take on "Suzanne" in her crystalline soprano is familiar to her many fans; the fine musical night that featured her trademark covers of Joni Mitchell's "Chelsea Morning" and "Both Sides Now," and Bob Dylan's "Masters of War" and "Mr. Tambourine Man." Collins, blue eyes flashing under her silver mane, chuckled over her memory of Robert Zimmerman who sang Woody Guthrie songs: How was he every going to make it, she mused, back in the day. For this Café Carlyle tenure, she's teamed up with Ari Hest, a singer songwriter with whom she recorded Silver Skies Blue. Together they sang "Strangers Again," "I Choose Love," "The Weight," and "Silver Skies Blue," songs they wrote together, and Stephen Stills' "Helplessly Hoping." Other highlights of this special night under Russell Walden's excellent direction: Collins alone on piano for "The Blizzard," and her signature take on Stephen Sondheim's "Send in the Clowns." Perhaps for the rest of her two-week run, Collins will say more about her history with Leonard Cohen, a music legend and her inspiration, who first suggested to her in 1967, "why don't you write your own songs."